Now supporting Auth for every bank and credit union in the U.S.
We’re excited to introduce an upgraded Auth product that enables developers to authenticate accounts from any of the ~11,500 banks or credit unions in the U.S.—in more ways that are fast, simple, and user-friendly. In 2018, we made big strides in expanding Auth’s coverage to 3,800+ institutions in the U.S., which covers 90% of all depository accounts. As part of our ongoing mission to deliver access to the financial system, we know every new user counts and not all of them bank at the largest institutions. That’s why we developed new ways to help you onboard even more users. The upgraded Auth product will intelligently guide users to the best method for account authentication based on the financial institution they select. Our hope is that every user will have a successful path to connect their bank account to your app so they can begin enjoying the benefits sooner. Plus, all account verification is handled through Plaid’s login module for a seamless user experience. Auth will still authenticate accounts in seconds using credential-based login for 3,800+ financial institutions in the U.S.—covering the majority of deposit accounts. This experience gets users up and running as quickly as possible so they can get the most out of using your app or digital service. For institutions that support Plaid’s Transactions product, we’re able to instantly authenticate accounts using account and routing numbers. Users provide their account information and Plaid will then match it with what’s on file at the financial institution. When accounts can’t be instantly authenticated, we offer a faster and easier micro-deposits experience. With Automated Micro-Deposits, users won’t have to wait 2-3 business days to come back to your app to manually confirm the deposited amounts. Plaid will automatically verify the deposit amounts for users and notify you when it’s done. To use Automated Micro-Deposits, users will need to provide their banking credentials along with their account and routing numbers. For the smallest banks or credit unions, we offer manual micro-deposits in which users will confirm the deposited amounts. Instead of waiting 2-3 business days for the deposits to post, Plaid offers Same Day ACH so micro-deposits appear in an account within 1 business day. For our beta participants, Vertbase and Rumbleship Financial, having a path to successfully link bank accounts from any institution was essential in supporting their growth. 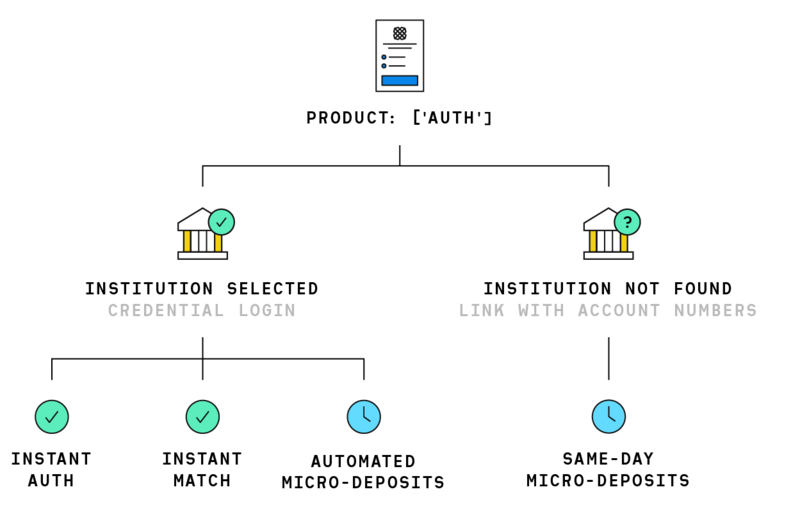 Auth allows our users to link their bank account with the Vertbase platform with little effort. The smooth and simple process has reduced the friction I've seen in the past when trying to get users to connect their bank accounts. The integration and support teams have also been incredibly helpful with integration and support. Being able to route customers – regardless of how modern and "up to date" their bank is – through a single flow has materially improved our ability to focus on our core business with confidence. Integrating the flow was a breeze, and we've significantly decreased the time it takes to get a customer into the purchasing flow. The new features are available now for Link Web and iOS. Check out our API docs for an overview along with information on the integration process. 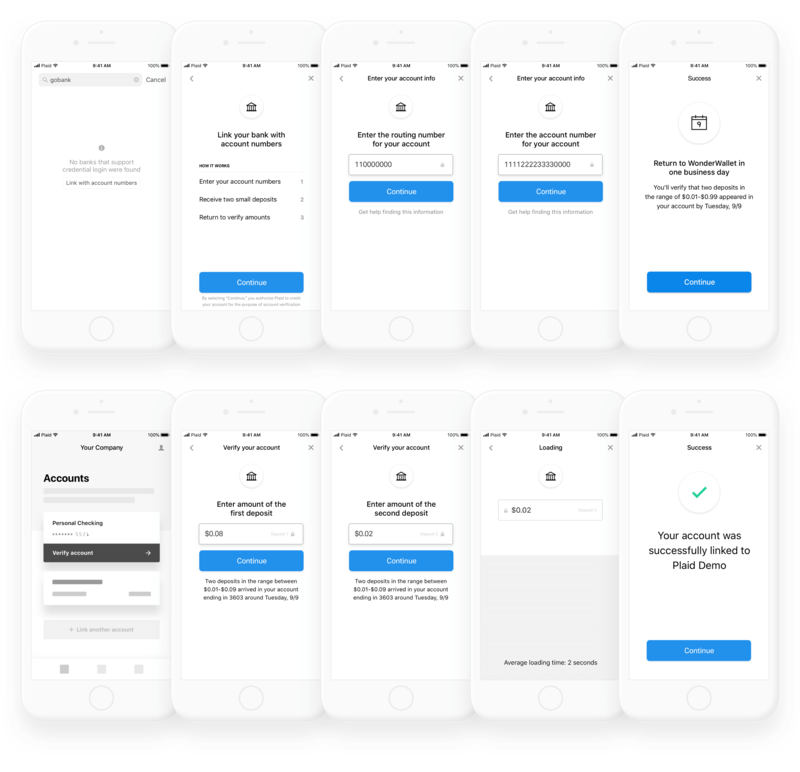 Plaid customers who are interested in enabling these features should reach out to their account manager to begin the process. Developers who are interested in trying out Auth can sign up for a Plaid account. If you have any feedback to share on these features, send us a note on Twitter or the Plaid dashboard.